Long ago, a band of wise men and their sacred cowbell tried to prepare us for this moment. They left us a cryptic warning, buried inside an archaic form of melodic verse. And we loved the way it sounded. We tried to decipher every word. We meditated upon it for hours, attempting to unlock any possible meaning. Days passed. Years went by. Decades. To this day, we have no idea what they meant. 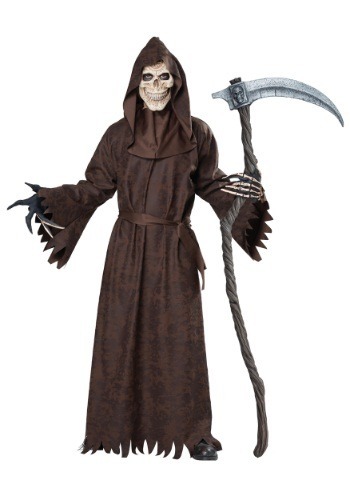 That's probably why we're as deeply afraid as anyone else when we look upon the skeletal face and long, bony fingers of this phantasmal Adult Ancient Reaper Costume! If only we had heeded the dire prophecy of those guitar-slinging soothsayers. If only we had known how! All we can say for certain is that the brushed flannel and tattered edges of this robe give this outfit a texture that makes it seem genuinely antique. And the hieroglyphic inscriptions on the mask have us fully convinced that it's inscribed with arcane power of unknown origin. But that's the limit of our understanding! The sad truth is that even if you're a cryptographic genius or an expert on ancient magical utterances, certain phenomena are still mysterious and terrifying, like this grim-looking reaper! But we've found that a great way of dealing with your fears is to embrace them. And a great way to embrace a spooky Halloween look like this is to wear it yourself! We don't have to be afraid of these reapers. We can be like they are!